By My Will, So It Is Done! "We are the shapers of reality, the masters of the Path. We move the Wheel of Creation on its forward course and counter those who would freeze the wheel in its tracks. "Now if we could only cooperate, we'd be in business!" 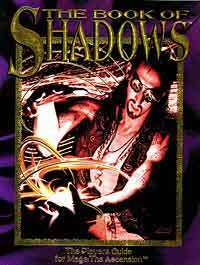 A Book of Shadows is a journal of the Path, a tome of revelations for the followers of magick. In this Book of Shadows, mage players and Storytellers will uncover lost secrets of the Traditions and their rivals. This is a valuable tome for mages everywhere! Expanded rules for magick, foci, familiars and more!